Orion meteors streak through the starry sky over Big Bend National Park in western Texas. This stellar self-portrait is a composite of four shots by Sergio Garcia Rill. Orionid meteors put on a dazzling show for skywatchers and astrophotographers who stayed up late (or woke up early) last weekend to watch this year's Orionid meteor shower at its peak. The meteor shower began in early October and will continue to produce "shooting stars" through the first week of November. 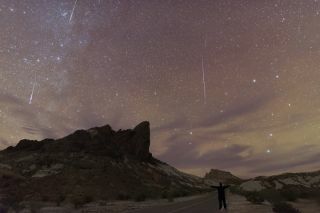 But the best time to see the meteors was during the peak on Saturday and Sunday (Oct. 21-22), when skywatchers were treated to up to 30 meteors per hour. The constellation Orion the Hunter takes center stage in this Orionid meteor shower shot by astrophotographer Gowrishankar Lakshminarayanan. He captured these Orionid meteors streaking through the sky over New York's Catskill Mountains on Saturday (Oct. 21). "Airglow was extremely high over the weekend," astrophotographer Sergio Garcia Rill told Space.com in an email. Rill went to Big Bend National Park in western Texas to shoot the peak of the Orionid meteor shower. He set his Nikon D750 to continuously take photos, then combined four frames of bright meteors — and one of himself — to create a stunning meteor- shower selfie. In New York, astrophotographer Gowrishankar Lakshminarayanan traveled to the Catskill Mountains for his Orionid meteor photo shoot. "I was fortunate to capture the Orionids in the early hours of Oct. 21 from North-South Lake Campground, which was pretty dark, and absolutely fantastic clear skies made for a great watch," he told Space.com in an email. "I was also able to capture a satellite flare to the right of Orion, which possibly is an Iridium flare." Farther south on the coast of New Jersey, veteran astrophotographer Jeff Berkes captured a stunning view of an Orionid meteor darting through some early-morning airglow shortly before sunrise on Oct. 21. Berkes saw about 20 meteors per hour and "at least four fireballs," or super- bright meteors — one of which left "a trail that glowed blue," he told Space.com in an email. An Orionid meteor passes over the Atlantic Ocean near the New Jersey coast just before sunrise on Oct. 21. Orionid meteors are bits and pieces of Halley's Comet, which swings by Earth about every 75 years. That trail of comet crumbs from Halley's Comet collides with Earth once a year in October, producing as many as 80 meteors per hour some years, NASA's meteor expert Bill Cooke told Space.com. If you missed the peak of the Orionid meteor shower this year, there's another meteor shower coming up soon. The Taurid meteor shower will peak in the Northern Hemisphere from Nov. 10 to Nov. 11. Then the Leonid meteor shower will follow shortly thereafter, peaking from Nov. 17 to Nov. 18.